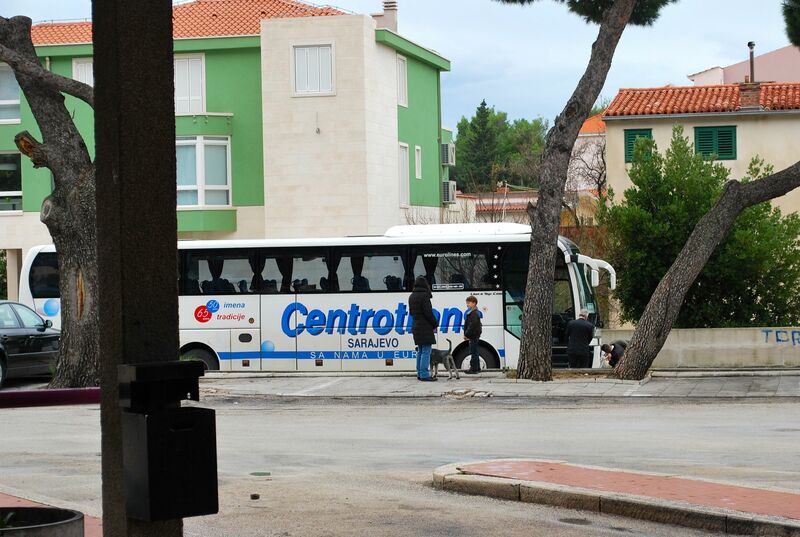 Just 15 minutes after I finished thinking about how every bus ride I have taken so far has been efficient and smooth, the bus lost power trying to get up the ramp at the bus station outside Split. We made it up many a hill and then it went kaput. It would only work in reverse. The bus was stuck in the middle of the street, and somehow 3 men ( the conductor in his three piece suit, and two passersby) managed to get it off to one side. The conductor said to get out and have a cigarette. So, unclear if the bus was going to be towed or fixed, we walked across the street o the bus station. Sunday morning. There were just 4 passengers on the bus. We waited while the driver borrowed a phone and called the office! Somehow, they managed to fix the bus. We got back on the bus and drove on without incident until we reached a fruit stand. Another bus had stopped there ahead of us. The two drivers conferred. No good. We drove another few minutes until we reached another stand. The conductor tasted an orange, tossing the peels by the side of the road, and the driver bought a bag. This reminded me of my first visit to BiH in 2009. On my first bus trip from Sarajevo to Mostar, the driver stopped at a restaurant for a coffee and cigarette. It was a long coffee break, although no time was announced. So far, I have not experienced a coffee break during this trip. At home, a small black and white kitten was waiting by my door. It wouldn’t stop crying, or let go off my husband’s legs and is now curled up on my lap. It looks to be about 6 weeks old. So frightened that it was shaking hard as it ate. Inhaled its food. Hopefully, we can get it to a vet and see to its health. Funny how some cats naturally gravitate to people.